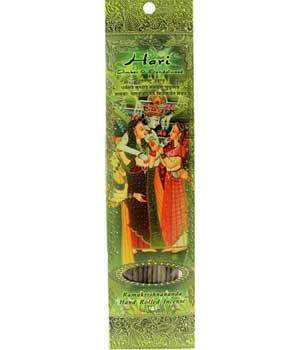 The sweet and slightly citrusy fragrance of the Hari incense helps to uplift and open the mind. Both of its ingredients, amber and sandalwood, have excellent qualities for purifying and spiritualizing the environment, makes this incense a wonderful companion for meditation, prayer and spiritual practice. Hari, the one who removes the darkness, is Lord Vishnu, who is the light of the soul and whose appearance in one's heart immediately dispels the darkness of illusion.